Narrator Tavia Gilbert portrays the spunky and independent Piper Green with enthusiasm and drama. As Piper and the entire Peek-a-Boo Island community await the annual potluck dinner onboard the SEA STAR, she's thrilled. This year she'll joyfully be serving pecan pies and not mashed potatoes, her family's usual contribution. Or will she? Gilbert voices Piper's mercurial ups and downs. She can be high-pitched and indignant when circumstances are not to Piper's liking, low-toned and slow when Piper is given an important diagnosis by the doctor, or full of conviction when Piper explains nautical terms. 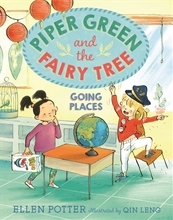 Gilbert's supporting characters have distinct personalities as well, especially the bossy classmate Piper abhors and Piper's goofy but optimistic younger brother.